We started early in the morning when it was dark. On the way from Wervershoof to Enkhuizen. This is on Enkhuizen Dyke. Spectacular morning sunlight setting ablaze the whole landscape - water on one side and land on the other. Green grass - fresh and vibrant with morning dew dripping from them. Breathtaking. The return journey - From Zuiderzee museum to Amsterdam... consisted of unending cycling on the dyke - with sea on both sides. It was enchanting as well as strenuous. 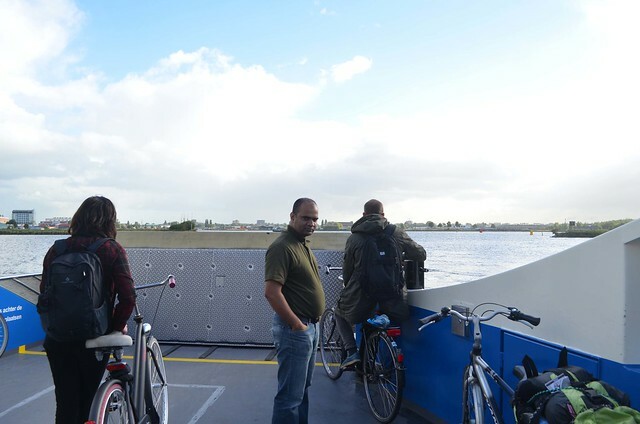 The sea breeze in the late evening was making cycling all the more difficult and we soon got inside Almere and avoided the route alongside sea to get rid of the breeze against us. We reached home at 5:00 am in the morning the next day - i.e. 19th Sep'2013.